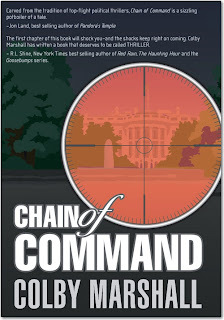 Today I’m thrilled to be hosting Colby Marshall, author of Chain of Command– a fast-paced political thriller. “The first chapter will shock you–and the shocks keep right on coming. Colby Marshall has written a book that deserves to be called THRILLER.”–R.L. Stine, New York Times bestselling author of Red Rain, The Haunting Hour, and the Goosebumps series. Doesn’t it sound amazing? I’m excited to read about the feminist and political issues as well as trying to unravel the mystery. It sounds like there is going to be a good mix of action and intrigue. And R.L Stine recommended it! Sold! Throughout my (very brief) career as a writer, I’ve noticed a common theme amongst folks who hear I’m a writer: they all know a lot about books. From people telling me about the story they wish I’d write for them to the comments about how I should “get into Oprah’s book club” (no, seriously. Someone said this as though it was all up to me! ), it seems like when it comes to the publishing business, if they’ve read them, they’re experts. I know, I know. In reality, comparing the two is like saying that because you’ve been to a Knicks game that you should coach the team. It can be rough to hear comments like, “Oh, you wrote a book? My aunt’s best friend wants to write a book, too!” Equating the far away bucket list desire of someone you’ve never met to this piece of your soul you’ve pushed into the world with your blood, sweat, tears, and sanity can feel like someone is peeling your fingernails back with a pair of pliers. And yet, when you think hard about it, the reason behind these comments is so fantastic. It means people are interested in books! Think about it: when someone mentions that someone plays for the Knicks (okay, so that never happens. But pretend with me), its far less likely for someone to take it and relate it to their personal life. Having people interested in books is vital to an author’s success, so what better way to start a conversation about this than to have someone bring to your attention their experience—whatever it may be—with books. So the next time someone makes this comment to you as a writer, instead of suppressing the urge to roll your eyes or worse, bite back, say something like, “Writing is such a passion for so many people, and publishers are buying less and less these days. To make room for more writers, it’s so important that you buy books, share your favorite books with friends, etc.” Trust me when I say it will go over better with them, and you’ll probably feel better about the conversation later. Besides—you can always still roll your eyes if you need to when you’re safely back by yourself. Have you ever had someone comment on your career in a way that bugged you? How did you deal? Writer by day, ballroom dancer and choreographer by night, Colby has a tendency to turn every hobby she has into a job, thus ensuring that she is a perpetual workaholic. In addition to her 9,502 regular jobs, she is also a contributing columnist for M Food and Culture magazine and is a proud member of International Thriller Writers and Sisters in Crime. She is actively involved in local theatres as a choreographer as well as sometimes indulges her prima donna side by taking the stage as an actress. She lives in Georgia with her family, two mutts, and an array of cats that, if she were a bit older, would qualify her immediately for crazy cat lady status. 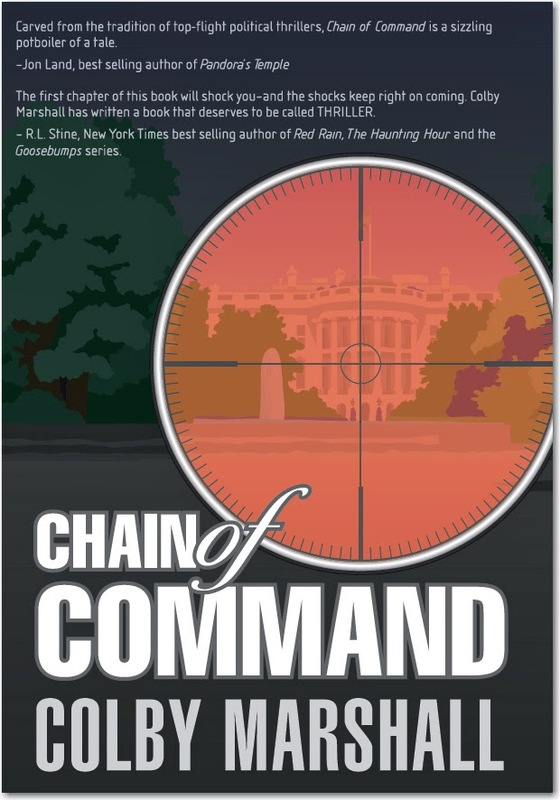 Her debut thriller, Chain of Command is about a reporter who discovers the simultaneous assassinations of the President and Vice President may have been a plot to rocket the very first woman—the Speaker of the House—into the presidency. Chain of Command is now available, and the second book in her McKenzie McClendon series, The Trade, is due for publication by Stairway Press in June 2013. « Gender and Book Covers: Where do you Stand? Thank you for having me over, Tizzy!